Makhaya Ntini has stepped down from his role as Zimbabwe bowling coach after two years with the African nation, including a short spell as interim head coach. Ntini filled in following Dav Whatmore's departure in May 2016, with Heath Streak taking on the permanent head coach role five months later. The former South Africa seamer originally signed a two-year deal with Zimbabwe, but the 40-year-old has opted not to renew terms. 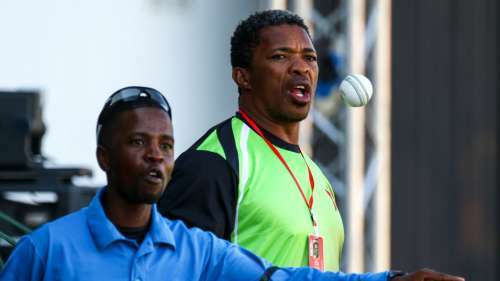 "It is with regret that Zimbabwe Cricket (ZC) announces that Makhaya Ntini, the national team bowling coach, has tendered his resignation from ZC with immediate effect," read a statement from the governing body. "Makhaya has brought a wealth of experience and practical knowledge to ZC, and ZC and its players and coaching staff were fortunate to have had an opportunity to work closely with him during this period, and to learn from his many years of playing for Cricket South Africa at the highest level. "While reluctantly accepting his resignation, ZC fully appreciates and respects the reasons behind Makhaya's decision, and wishes him all the very best for the future." Ntini's announcement came on the same day that Streak named his one-day international squad for their tri-series with Bangladesh and Sri Lanka. Brendan Taylor returns along with Kyle Jarvis after their international exile ended in the recent Test series with West Indies, while there are also places for Brandon Mavuta and Ryan Murray. Series hosts Bangladesh have made five changes to their squad for the first two matches of the, with Mustafizur Rahman included, while Taskin Ahmed and Soumya Sarkar have been dropped.